When you're pushed for hard drive space, the quickest way to reclaim it is to delete files. But which ones? Getting rid of duplicate files is better than getting rid of more vital files, but finding them isn't easy: they can be scattered all over and given different names. Decloner attempts to make finding duplicate files easier than guesswork. It scans whatever area of the hard drive you want and creates a 'fingerprint' for each file. If the fingerprint matches that of another file, they're the same, no matter how they may have been disguised. The program then lets you use Quick Look to view the files it thinks are duplicates to make sure it's not imagining things. Then when you're sure, you can get Decloner to move files you've marked as duplicates to the Trash. Running this application requires a few attempts to get things running properly. Numerous browser cache files and thumbnails will show up as duplicates so you'll need to take advantage of Decloner's filtering system. Running it on your whole hard drive will slow up your system and may result in crashing. There's no administrator option for you to compare your files with other users' files. We also found it would flag up some files as duplicates of themselves. 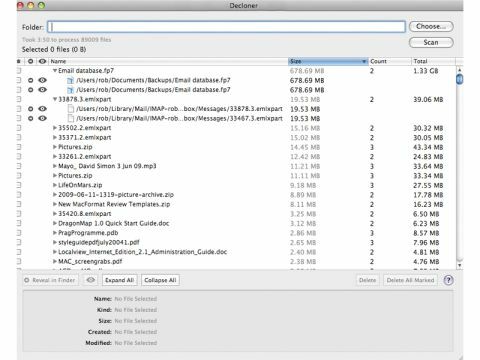 Decloner is a decent, but flawed utility that can help cope with a cluttered hard drive. But the work required makes it less desirable than a new hard drive.